Blunt wraps have a variety of styles, sizes and flavors. At times, it can be quite an overwhelming task to decide the one that you like best. Some of the deciding factors include a specific budget or a special choice. In any event, there is a list of the top blunt wraps that you should consider buying. We have presented them here for you to make your own choice. The Swisher Sweets blunt wrap is available almost everywhere that stoners reside – all over the world. These are the most popular in the United States and are considered flavored cigars. Most people don’t use the Swisher Sweets blunt wrap as how it was originally intended. Some smokers cut a long slit down the blunt wrap and take out the tobacco inside, refilling it with their option of grinded marijuana buds. In other words, the blunt wrap becomes filler for the weed. The Backwoods Blunt is used to make cigarillos, which have been rolled using a single organic tobacco leaf. This becomes the wrap and so rather than cut a long slit as done in the case of the Swisher Sweets wrap, just unroll the blunt wrap and fill it with weed. Tropical Fusion blunt wraps are addition to the Swisher Sweets blunt wrap brand. This is one of the wraps that have also been popular in the United States. If you no longer want to smoke the normal blunt wrap from the Swisher Sweet line, then you will love Tropical Fusion as it comes with more flavors including a tropical flavor with a mix of berries and fruit. The High Hemp Company manufactures blunt wraps that are hemp-based. They get their hemp from Holland and its surrounding region. The hemp is vegetarian and non-GMO. It is also organic. Zig Zag is mostly associated with joint wraps. You can buy them individually or in two counts of blunt wraps. You can buy them in a variety of unique and assorted flavors. 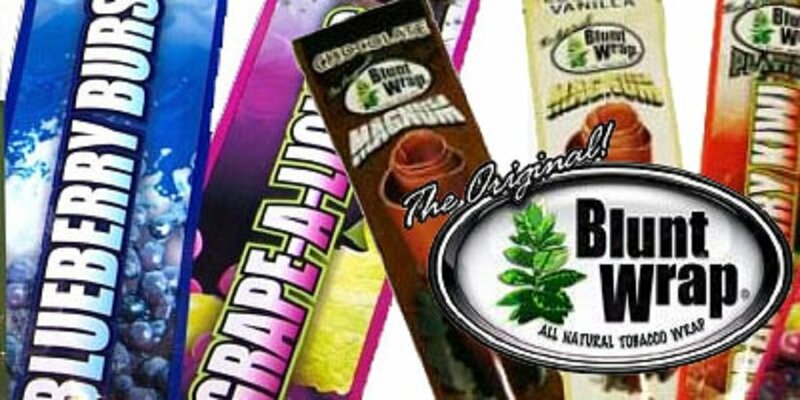 Grapeape High Hemp blunt wraps is popular and one of the flavors that has been used by many stoners to make a joint. They have a wide range of flavors that includes Autumn Royale, Candice and Concord. White Owl blunt wraps are worth mentioning. It comes in different sizes, some of which can fit up to one eighth flower. Many stoners love to have that extra space to pack more weed. It is a little bit challenging to unpack these blunt wraps compared to other brands. However, one way to do it easily is to cut the mouth of it and then roll out the tobacco from the mouth. The Dutch Masters is one of the most classic for rolling blunt. Most people buy them for their earthy flavor. In addition, you get a better smoke when you use earthy marijuana strains with them. They may be a little hard to work with, but doable. They also tend to be more expensive too. So, beware of this, if you are a new smoker. Optimo Peach blunt wraps are very reliable and excellent in terms of having good cigarillo. This has a peach flavor and that is why the reason for the name. You get that additional sweet smell and taste from it. You can expect to get a longer burn from these wraps and they don’t hit that hard as other wraps do. So, these are great for people smoking for the first time. This is one of the blunt wraps that you use for special occasions, if you want to be classier. It is of gold standard since it is made from 24-carat gold leaf, which can be smoked. It is obvious that you have several blunt wraps to choose from and more are hitting the cannabis market as we speak. However, these are the best ones so far.